Several specimens of grass bugs have been brought to our office in the recent weeks. These are of varying sizes (about 7-12 mm), but identified by the CDFA systematist, Rosser Garrison as Arhyssus sp. 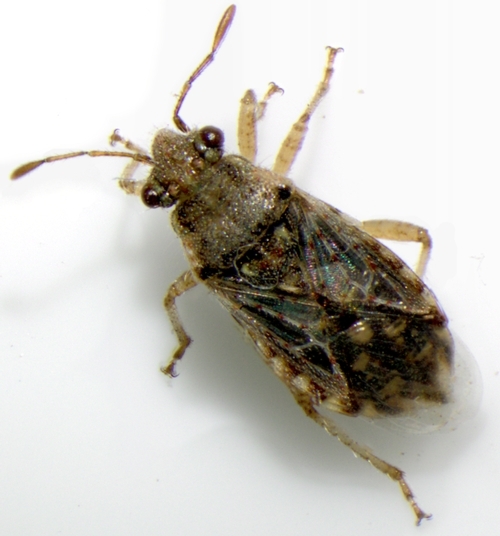 They belong to the family Rhopalidae (Order Hemiptera), members of which are commonly known as scentless plant bugs. They mostly feed on xeric (require less water or adapted to dry habitats) and other weed plants. Sometimes they enter homes in search of protected places. Grass bugs are similar to coreids or leaf-footed bugs except they do not have well-developed scent glands and smaller than coreids. These can be confused with false chinch bug, Nysius raphanus (family Lygaeidae) which are also found in weedy or grassy areas and migrate to homes. Damage: They usually do not cause any serious damage in the home gardens. However, they can be a nuisance when entering the homes in large numbers. Management: Sealing the windows, keeping the doors closed or using the screen doors, and vacuuming are the best practices to keep them out or clean them up.